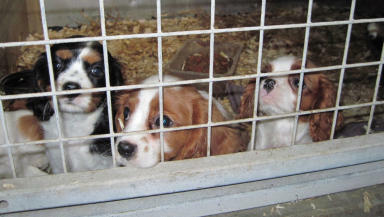 Scottish Government and animal charities continue crackdown on puppy farms. A campaign highlighting the pitfalls of buying illegally-bred puppies has been launched by the Scottish Government. Research shows that Scots are more likely to buy an illegally-bred puppy than they might think, with only 24% of Scots buying from an approved breeder and 25% considering using an online advert or website to buy a puppy. A quarter of those bought online die before their fifth birthday and one in three get sick or die in their first year. The Buy a Puppy Safely campaign was launched by Mairi Gougeon, minister for rural affairs and natural environment, as the Scottish Government calls on the public to learn about the warning signs of an illegally-bred puppy. Ms Gougeon said: "Illegal puppy farming only leads to misery - many suffer from congenital health problems or behavioural problems, causing distress to owners and leading to expensive vet bills that can cost thousands of pounds. "So, we're working with animal welfare charities to raise awareness of the real consequences of buying illegally and highlighting how to spot the warning signs of an illegal dealer. "I know that a lot of people will be considering buying a puppy at this time of year, so my message to them is to do your homework first. The most important thing is to see the puppy with its mother, and to get the correct paperwork. If there's no mum and no paperwork, then walk away and report your concerns to the Scottish SPCA helpline." Mike Flynn, Scottish SPCA chief superintendent, said puppy farming had a devastating effect on animal welfare in Scotland. He added: "As part of our frontline fight against those involved in this criminal activity, we are spearheading Operation Delphin, a partnership with a number of organisations, set up to end this cruel trade. Over the past year we have also been raising public awareness of the barbaric puppy trade in Scotland through our collaborative #SayNoToPuppyDealers campaign, and we are proud to support the Scottish Government on the launch of Buy a Puppy Safely. "It is our hope that this will make it easier for members of the public looking to buy a puppy to avoid falling victim of this cruel trade." The trade of puppies in Scotland online is estimated to be worth £13m per year. A large proportion of these are believed to be illegally bred puppies including popular breeds such as pugs, French bulldogs, cockapoos and miniature dachshunds. 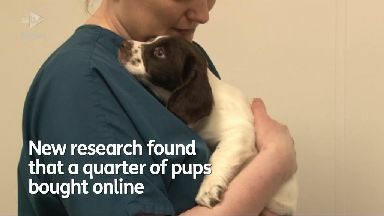 The campaign is being supported by a new website - www.buyapuppysafely.org - where buyers can find out how to spot an illegally bred puppy, both online and in person.